Gani and Sons - the one stop shop for all your horological needs. We are the Official Service Agents for Rado, Rolex, Longines, Tissot, Seiko etc. We have installed more than 300 tower & drum clocks in India and abroad. We supply GPS based systems with digital LED displays and self correcting analog displays. We provide watches with custom logo for corporate gifting and have our own brand Astralo. We specialize in Pillar Clocks and many of our tower clocks have Chiming and Striking systems. We have installed more than 50 Tower clocks in Chennai alone. We sell a range of Grandfather Clocks and cuckoo clocks. 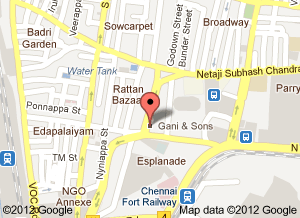 31, Rattan Bazaar, Chennai - 600 003. Tamil Nadu, India. Mobile: +91 95 0000 1909. 846-A, Anna Salai, Chennai 600 002. Tamil Nadu, India.